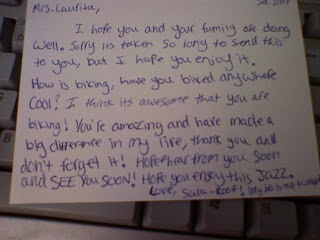 I just received this note from a student I had 3 years ago! How cool. It totally made my day and put a smile on my face. I remember Sara-Ruth as such a good student and so much fun to have in class. One day of receiving notes like this makes up for a whole lotta stressful days at school, that's for sure. It's great when people let you know that they appreciate what you do or did for them.